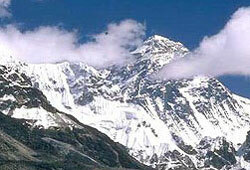 Everest base camp trek is a trip of a life time, a world class holiday. Everest is the highest mountain in the world at 8848 m and to see the world's highest mountain from near is a dream of many. Everest lies in remote, eastern Nepal bordering with Tibet, there is no road access to Everest and the only way to see it from near is by walking there. This trip takes you to the base camp of Everest to appreciate its majesty from near and ends with an ascent of Kalapattar, a small hillock near Everest that commands finest view of Everest and its neighbours. Being the world's highest mountain is not the only thing that makes Everest famous. Everest base camp trek will reward you with a spectacular mountian panorama, exotic alpine scenery, secluded Buddhist monasteries in the high Himalaya and the legendary Sherpa inhabitants of Everest region .All these truly justify the reputation of an Everest trek. The mountains seen on Everest base camp trek include Everest, Nuptse, Lhotse, Amadablam, Cho o yu , Pumori etc.Everest lies in the Everest national park, a world heritage site declared by the UNESCO. The Everest national park is the home for many of alpine flora and fauna. The Everest base camp trek starts with a exhilerating 45 minutes mountain flight to the Lukla airstrip which serves as the gateway to Everest region.From Lukla we trek along the valley of Dudh Koshi river and reach the Sherpa "capital" of Namche bazzar on the 2nd day. Namche is an active bazzar with shops selling trekking gears, supplies, bakeries and numerous guest houses for the trekkers.Reaching to Namche we already gain substantial height , so we stay for one day on this delightful sherpa village for acclimatization(adjusting our body to new altitude). As soon as we leave Namche we glimpse our first view of Everest, peeking above Lhotse Nuptse ridge.On the way we visit the famous Tengboche monastery which is the most important of all the Sherpa monasteries in Everest region. Tengboche offers stunning view of Everest, Amadablam and others.Walking slowly and acclimatizing again at carefully we keep on ascending soon to find ourselves in Gorakshep. After we visit the base camp we head for a small ridge called Kalapattar which offers breathtaking views of Everest and the Khumbu icefall. During the trek we sleep and eat at the mountain lodges called tea houses.The porters and the yaks will carry your luggages , you will carry just a light daypack with the things you may need during the day. The average walking hours will be 5 to 6 hours. Day 02: Sightseeing tour of Kathmandu city including Pashupatinath, Bouddhanath, Swoyambhunath and Kathmandu Durbar square. Day 16: Walking around Kathmandu,shopping . Farewell Nepali dinner with cultural show.